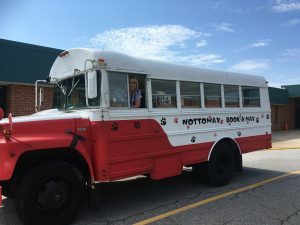 The Nottoway Book-A-Way bookmobile came to life just 3 summers ago because of my dream. My dream was to deliver books to students all through the summer. The students in my county did not have access to books all summer, and they didn’t have transportation to be able to come to our school libraries, so the famous summer slide was a definite issue for us. I addressed this problem by starting the bookmobile, and it has been a great solution to this dilemma. 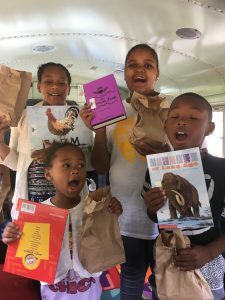 The bookmobile travels every week during the summer months, Monday through Thursday. Students can check out a book, get a free lunch, and most importantly pick out a book to keep as their own. Watching their faces as they realize they can pick any book to have as their own just melts my heart on a daily basis. 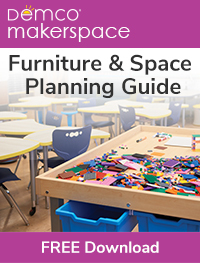 I have a huge selection of books for them to choose from: hard cover to paperback, board books to college texts, preschool through young adult, and even a huge selection of cookbooks. Students can choose any book they desire, no restrictions. There are no reading levels on the bookmobile! 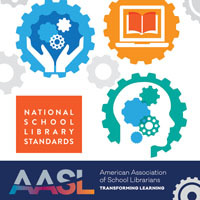 The AASL Innovative Reading Grant sponsored by AASL and Capstone Publishing has been an awesome boost to this summer’s program and to the bookmobile itself. The publicity and promotion has been amazing. My goal this summer was to reach more middle school students than in previous years and to increase the overall reach. My summer plan for this year has been a great success. Students love the new themes every week and can’t wait to see what the bookmobile will have in store for them. I rotate the special days of events so that the suspense and surprise increases the excitement. One of the most popular themes, Popsicle Palooza, had students receiving free popsicles, as well as a huge selection of non-fiction books about polar ice caps, polar bears, cookbooks, global warming, and vanilla-scented ice cream bookmarks! All these cool things on a hot summer day, in addition to free books, was the best ever. Middle school students love to eat and love something sweet, so this has been a successful venture. Their attendance has risen from last year, due to these new promotions. Thanks to Capstone Publishing and the AASL Innovative Reading Grant I have been able to enhance and promote the bookmobile this summer. I know that this grant will have a lasting effect on my bookmobile program for the next several years. It has been just so successful, that I will have to continue to supplement the bookmobile program with new themes every week, every summer. The kids will ask for a hint to the next week’s theme and excitement builds throughout the week. Since it has been so successful and the students absolutely love the weekly themes, I know that I will continue this avenue for bookmobile promotion next year. 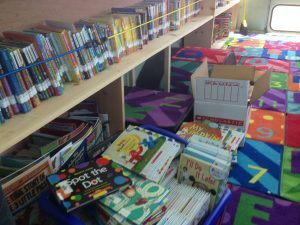 The outcome has been an increase in the amount of students I am seeing every week and an overall increase in the bookmobile participation throughout the county. The Nottoway Book-A-Way bookmobile has been the best thing I have ever done in my life, outside of having 5 children of my own. It is the most rewarding aspect of my job and I just love being able to deliver books to the students of Nottoway County. 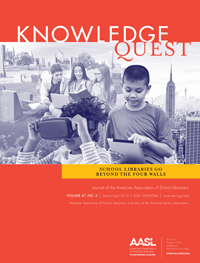 A giant thanks to AASL and Capstone Publishing! LOVE! LOVE! LOVE this!!!! Thank you for the passion and efforts you are giving to this project. You are inspiring so many people!!! I am so happy for the children of Nottoway who are benefiting from your fabulous creative ideas and generous time! I feel certain that parents are also appreciative that you are opening doors and opportunities for their children to read and improve their reading comprehension and education. Hope to join you for a day or two helping out on the Book-Away.